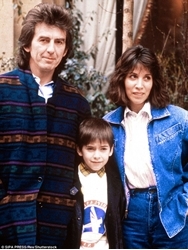 Dhani Harrison Continues His Family's Legacy and Forges His Own Path . Beatles Radio: The Beatles, Solos, Covers, Birthdays, News The Fab 4 and More! A certain Beatle once sang that it don’t come easy. That was Ringo, but in this case, he could be referring to the steady career climb of Dhani Harrison. As the son of George, Harrison could have easily been saddled by the weight of his famous last name. Instead, he’s quietly cobbled together a career that children of Beatles would be envious of. In late July, Harrison did something that many would have suspected he’d done a long time before. Though fairly mundane in terms of being a major shock, Harrison performed under his own name for the first time. His show at the Echo in Los Angeles was an intimate affair, but it was also sold out instantly with little fanfare ahead of it. For years, he was just a face in the crowd as a member of rock outfit thenewno2. There, Harrison learned how to work within a rock band on his own that put together some stellar albums. They toured and performed at festivals like PJ20 (where Harrison sang “State of Love and Trust” with Pearl Jam) Lollapalooza and everything else of that sort. He also jammed with Ben Harper and Joseph Arthur in Fistful of Mercy, a band that rocks as heavy as its name would indicate.